Here we are again it's Thursday, and here are my reasons to be cheerful. 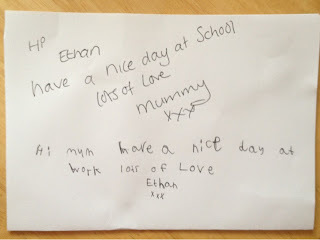 1,This is my first week back at work, I have to be honest, it has been hard getting up at 5am lol, but it has been great getting back to my normal busy routine, I always leave my son a little note before I go to work, as he is still asleep when I leave, he leaves me a note too, this always makes me smile. 2, I was so lucking to attend the Lush blogging event in Covent Garden today, I absolutely love their products, I will be blogging about their fab new invention, keep your eyes pealed you will love it. 3, As you know Christmas is approaching fast, we had a lovely evening Tuesday making Christmas cards. Please pop over to mummy from the heart the lovely lady who hosts this fab linky. Labels: cheerful, christmas, lush, reasons, work. 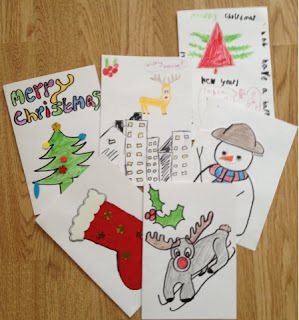 Love the colourful Christmas cards. 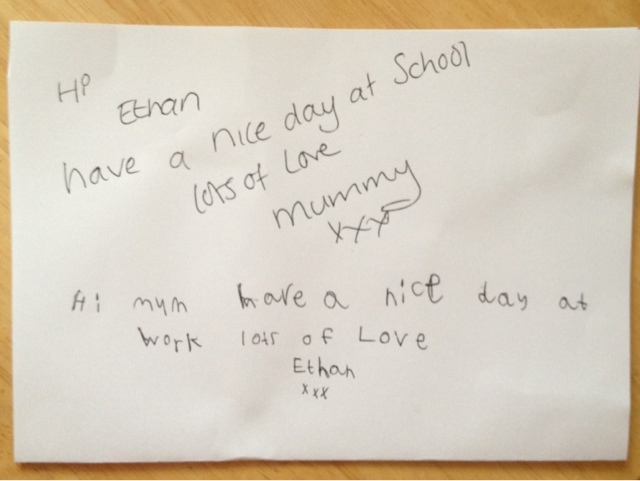 The note is so sweet. Oh no, don't remind me of Christmas! I'm nowhere near organised!! Eek!